The ECO product line offers a high level of safety with optimal efficiency. 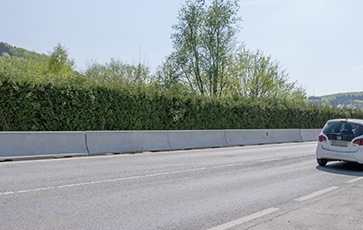 Systems with containment level N1 – H2 are a fixed component of motorway central reservations and along verges. REBLOC® offers a wide range of products. Systems with low working widths offer the ideal conditions for use in central reservations. REBLOC® has just the system for all installation conditions on asphalt, concrete, compacted soil and bridge caps. A range of systems (free standing, embedded, anchored soil, anchored, position secured) enable high levels of safety in any application. All systems offer simple installation, whatever the weather. The system 100SF_8_H2/W3 is also available as bridge system 100SFA_8_H4b/W4 with anchored position securing and as 100SFP_8_H2/W3 with pin as position securing on the bridge cap. Additionally, the system is available free standing 100SF_8_H4b/W5 and as asymmetric System 100SFS_8_H4b/W5. 80XAS_8 is also tested for T3/W2! 85BF_8 is also tested for T3/W1! The system 100SFP_8_H2/W3 is also available as bridge system 100SFA_8_H4b/W4 with anchored position securing on bridge cap and as free standing system 100SF_8_H2/W3, 100SF_8_H4b/W5 and as symmetric system 100SFS_8_H4b/W5.